Prompted by growth and consumer demand, Starbucks has announced a USD $120 million expansion of its Augusta Soluble Plant that will nearly double the size of the operation and create up to 100 new jobs at the Georgia facility in the year after construction is completed. The expansion, which will add 140,000 square feet to the current 180,000-square-foot plant, will begin this summer and is to be completed in late 2019. The plant currently employs 185 Starbucks partners. The 80 to 100 jobs created in the year following the expansion will cover a range of positions, according to Tim Filipowski, the plant director. Currently, one in six Augusta partners are armed forces veterans or military spouses. The plant maintains a close relationship with Fort Gordon, which is 20 minutes away. In addition to hosting job fairs at the base, where 12,000 soldiers are stationed, Starbucks conducts regular plant tours for service members, maintains an Adopt a Unit programme and supports the annual Fisher House Golf Tournament, which generates funds to aid families of patients receiving care at military and Veterans Administration medical centres. In 2013, Starbucks set a goal to hire 10,000 service members, veterans and military spouses by 2018. The company reached that goal earlier this year and announced a new target of 25,000 by 2025 at the Starbucks Annual Meeting of Shareholders. Starbucks opened the plant in Georgia’s second largest city in July 2012. 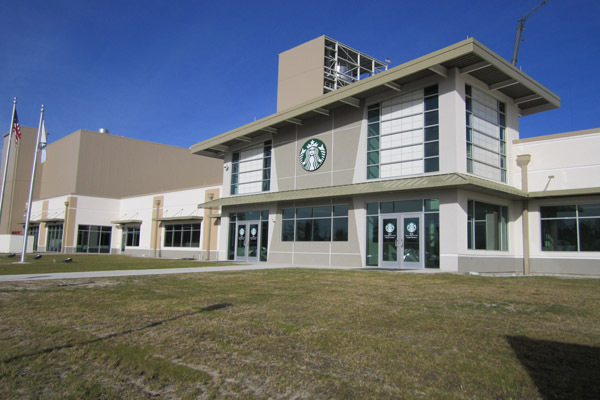 It is the first company-owned facility in the world to produce Starbucks soluble products. The plant’s two roasters generate Starbucks VIA Instant, as well as the coffee base for Frappuccino blended beverages and many of Starbucks bottled and canned beverages. The expansion will add six new whole bean roasters, allowing the plant to offer packaged coffee to Starbucks stores and retail locations in the Northeast and Southeast United States. Nathan Deal, Georgia governor, said the expansion affirms the region’s reputation as a gateway to the Southeastern market. “As Georgia grows its reputation as the gateway to the Southeastern market, companies like Starbucks continue to strategically locate and expand operations here,” comments Deal. Starbucks plans to add 12,000 stores globally by 2021, bringing the total number to 37,000. Last month, Starbucks announced it was expanding its Carson Valley Roasting Plant and Distribution Centre in Nevada by an additional 700,000 square feet. The expansion will bring nearly 100 new jobs to the location in the first year after completion, bringing the distribution workforce to nearly 350. The USD $50 million project will wrap up in summer 2018. Only the distribution portion of the 341,000-square-foot building will be enlarged, allowing Starbucks to increase capacity and streamline regional sourcing. The roasting side of the operation will be unchanged. The Nevada facility manufactures everything from coffee and syrups to behind-the-bar supplies, and services California, Nevada and Utah, as well as parts of Arizona and Asia Pacific. Between the Georgia and Nevada expansions, Starbucks will be investing USD $170 million and creating more than 200 manufacturing jobs.